Once upon a time, there was a thing called Earth Wolf. He lived and undied in a magic forest full of things and so forth, until one day he was wandering around with his mind also wandering around, walked smack into a pretty sunset, and got it all over himself. Being an outdoorsy sort, he didn’t really worry too much about cleaning up afterwards. And so, forever blasted by the colors, he lived or died the rest of his days doing the things that an Earth Wolf do, the end. 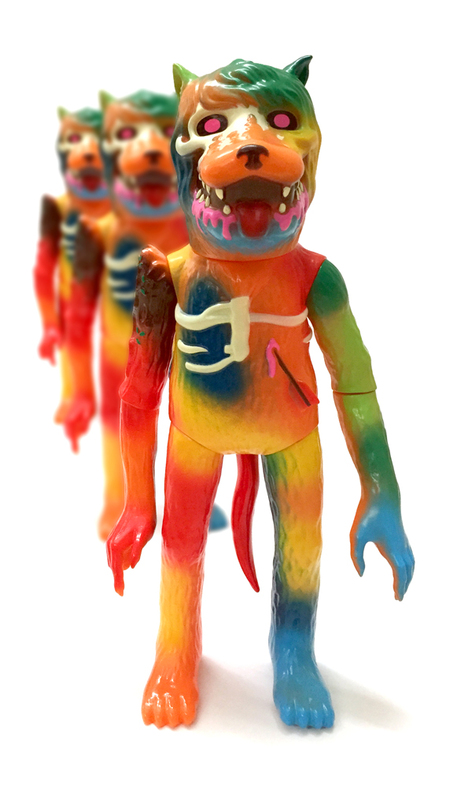 The Blasted Earth Wolf is cast in vibrant orange vinyl with plenty of colorfully sprayed details, available Thursday, March 5th, 12noon PST. $95 ea.